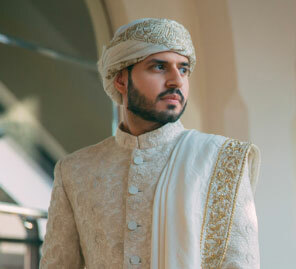 At WeddingSutra’s groomsmen shoot, Swapnil and his crew were treated to a special makeover courtesy Benzer's newest baraat collection comprising elegant sherwanis, jewellery and safas. Makeup artist Gayetri Chakravarty worked her magic and the gentlemen were pampered and coiffed. The stylish watches from Krafted Time were excellent accessories and the guys loved shooting with ace photographer Dev Purbiya as is evident from the pictures! Who says girls get to have all the fun? 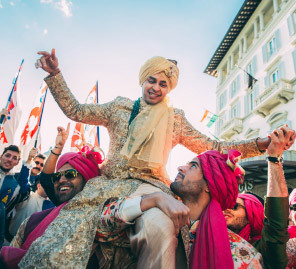 It was a boys’ day out for Swapnil and his gang of groomsmen - Dhruvesh Rathod, Siddhanth Modi, Dhruvil Shah and Sunny Kampani – as they got all styled up. Playing perfect escorts to pretty bride, Varsha, the squad showed off Benzer’s newest Baraat Collection like seasoned models. With the luxurious JW Marriott, Juhu as backdrop, standing by the gorgeous lily pond and pool, our talented Dev Purbiya coaxed the boys out of their self-consciouness into candid camaraderie. It helped that they were already looking their absolute best, coiffed to perfection with a little help from makeup whiz Gayetri Chakravarty before they headed out to pose for the beautiful feature. Varsha in her powder pink and blue net lehenga with golden embellishment over it looked picture perfect. She accessorized with a gorgeous antique necklace, statement earrings and chaandbalis. Makeup Artist, Gayetri Chakravarty accentuated her beautiful features with just a touch of blush and matte pink lipstick to complete this lovely bridal look. Dhruvesh wanted an indo-western aesthetic and this blue Nehru jacket with cascading draped jodhpurs worked well with his athletic physique. It takes a certain style quotient to carry off that matching pocket square and the dark brown sandals and he managed it with poise and looked very handsome. Siddhant chose a contrasting velvet crop jacket and cotton trousers. The rich blue sherwani jacket, its golden buttons, carefully tied safa and brown mojris, would even work at a semi- formal gathering. 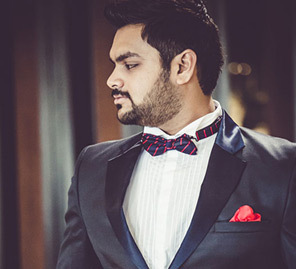 It was perhaps, Dhruvil Shah’s fun personality that had him favor a bolder choice for a groomsmen ensemble. Dhruvil chose to mix and match modern and traditional aesthetics, and wore a white kurta with an uneven hemline under a moss green flap jacket, teamed with a pristine white pocket square, safa and mojris. Sunny looked princely in an emerald green kurta sherwani with golden embroidery and a shoulder drape that added an element of interest to the sherwani dupatta. 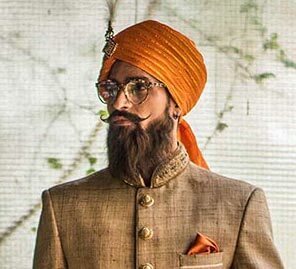 With a neatly tied safa, dark glares and brown mojris completed this dapper groomsmen look.